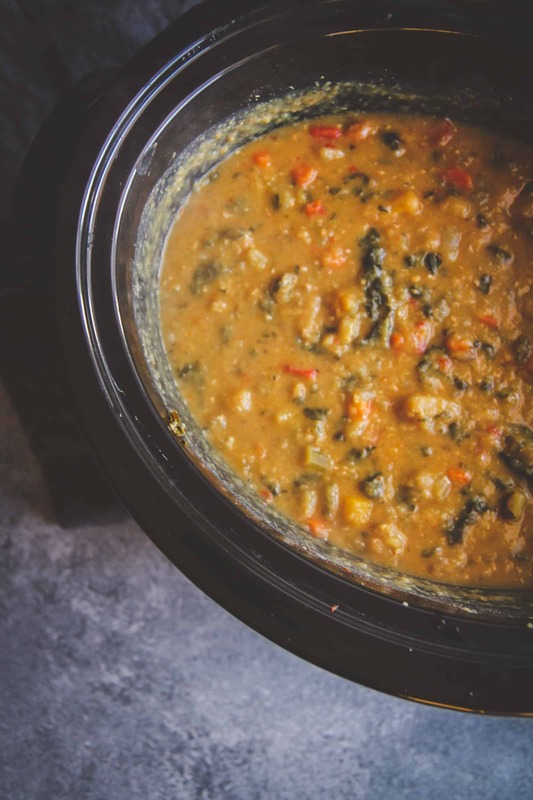 Stay warm with this healthy slow cooker lentil and vegetable soup recipe. It’s one of those amazing set-it-and-forget-it recipes and is great for making for healthy meals to take for lunch throughout the week! Welcome to a new year. How were your holidays? I took a much needed break over the holidays, after posting the reader favorite recipes of 2017 ( click here for reader favorite recipes from 2016), I shut down my computer and only checked email via phone, occasionally. This lentil and vegetable soup is packed full of veggies. It’s so comforting! And whenever I’m talking about comforting meals and dishes, I always think of the South. Last year I got to tour behind the scenes at Southern Living Magazine, an event that was cosponsored by Delta Faucet. It just so happened to be a coincidence that the faucet in my kitchen was leaky. As I toured the Southern Living studios I was in awe of all their amazing faucets- they were all Delta Faucet and the ones that one just touches and the water comes on/off. When I got my very own Touch2O Technology faucet from Delta, I was beyond happy and grateful. The faucet makes washing everything so easy! When I was cleaning and prepping the veggies for this soup, it took me a fraction of the time because I was able to use the pull down handle, and turn it on/off with my arm. It’s the little things, right? With the start of the new year, there’s always a desire for healthier recipes, and healthy slow cooker recipes are some of my faves. When it comes to soups, I have to admit that I’m not much of a brothy soup type of person. 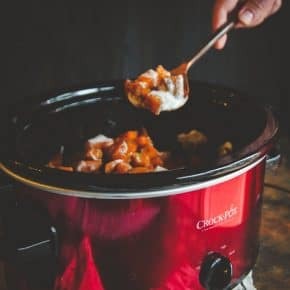 I like a more heartier soup (like this slow cooker beef and sweet potato stew) – a soup where you can just put ingredients into a slow cooker and it comes out great. 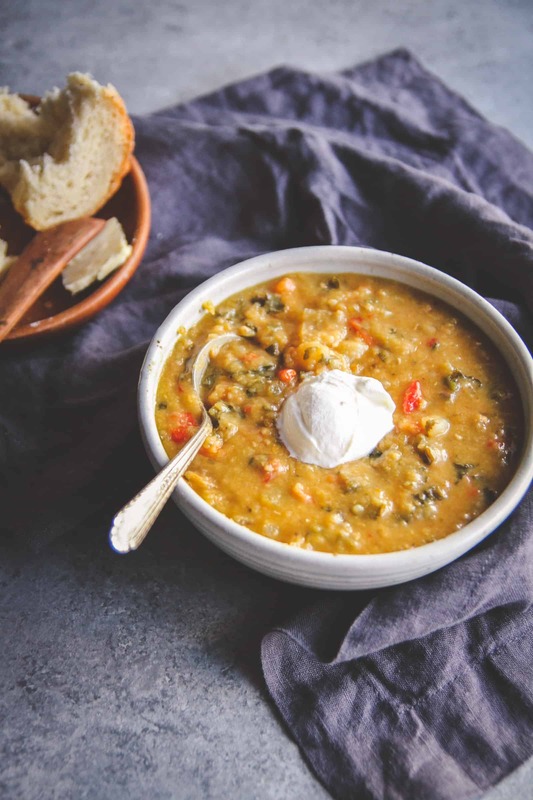 This lentil and vegetable soup does just that. It goes into the slow cooker, does it’s cooking, and voila, a delicious soup is the end result. Because this soup uses red lentils, the texture is nice and thick at the end, almost creamy. Sometimes to get a thicker soup, recipes call for putting the soup in a blender. Not with this soup! The red lentils cook and become soft and stir in beautifully with the other veggies for a delicious soup! You can definitely use other lentils, but they might not cook down like red ones do, still delicious, just not as thick in texture. If you love this recipe, another recipe you might enjoy is this red lentil chili! 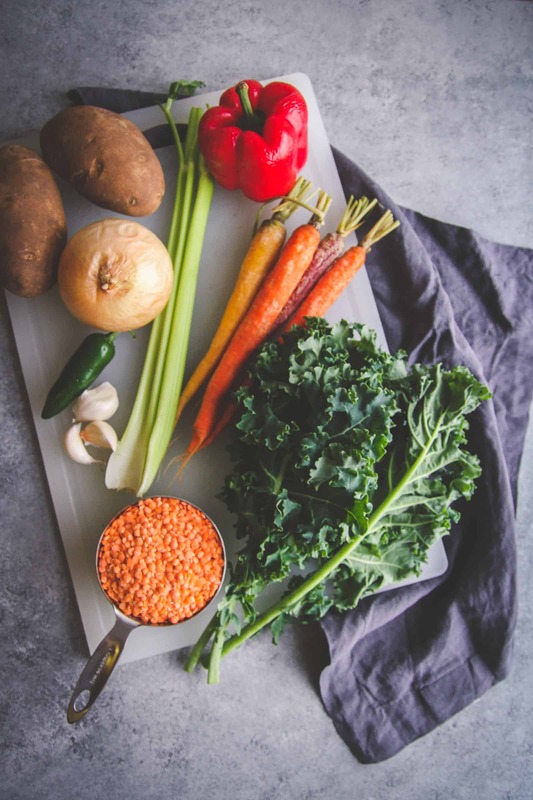 Next time you’re looking for a comforting healthy meal, make this slow cooker lentil and vegetable soup recipe. Place all ingredients in a slow cooker and pour in vegetable stock. Cook on high for 5 hours, or low for 8 hours (low is preferred). Stir a few times throughout the cooking. If you like a more brothy soup, add in 1-2 cups additional stock. 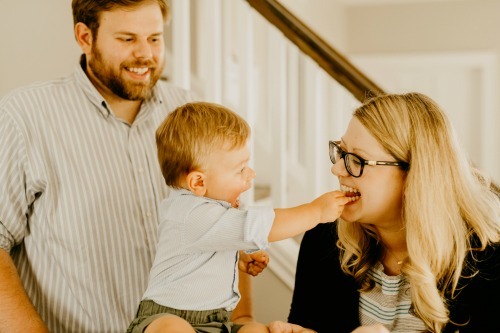 This post is brought to you in partnership with Delta Faucet & Southern Living Magazine. As always, all thoughts and opinions are mine alone. 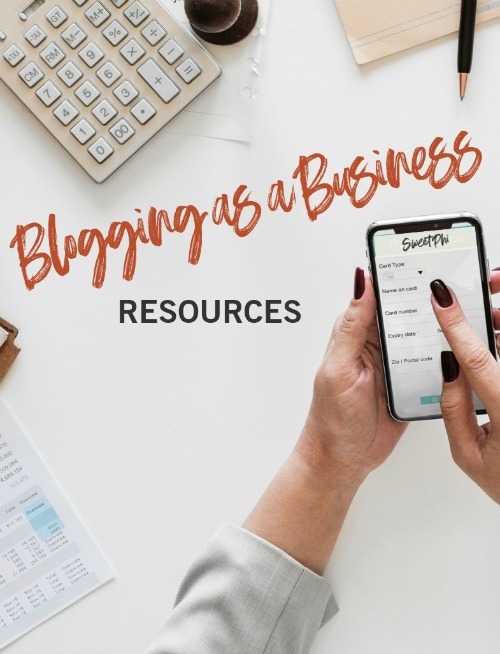 Thank you for reading about the brands and partnerships that make the SweetPhi blog possible. Love this recipe! As a student, having easy, healthy, slow cooker meals that last me throughout the week is a true blessing. This first time I made this, it wasn’t as creamy – but this time around after a few adjustments (less carrots, more lentils) it was perfect! Definitely keeping this one in my arsenal. Omgosh!!!! This was delicious! On top of that my whole house smelled like I was cooking beef stew even though it has no meat. Everyone loved it..even the meat eaters. I didn’t change a thing nor would I want to. Excellent!! You’re so welcome, thank you for commenting, so glad you enjoyed the recipe!! This is my favorite crockpot soup recipe ever! 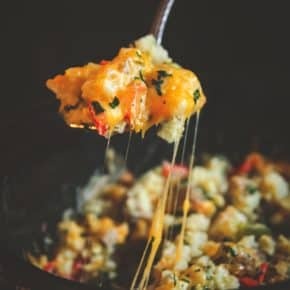 I make it all of the time & have shared the recipe with friends! I’m so happy to hear that Chris, thank you so much for sharing how much you love this soup! I’m so happy to hear you liked this! Thank you so much for commenting with your variations, it sounds delicious! I’m so happy to hear that, thank you so much for coming back and commenting – totally made my day!! My soup came out a lot runnier than the recipe says. TBH I would use about 1/2 cup less of broth. 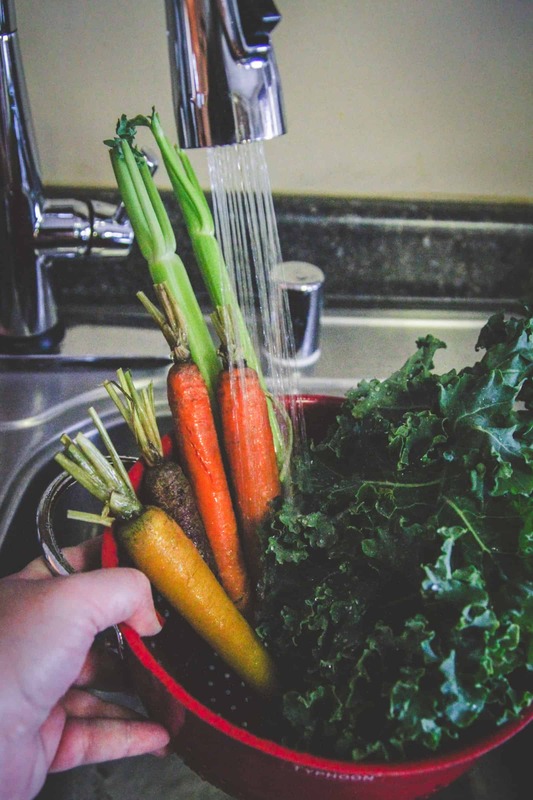 Some of the vegetables release liquids as they cook. Making this for the second time tonight. My husband said it’s the best soup he’s ever had! I’m so happy to hear that, so glad you guys love this soup!! Can I sub sweet potatoes for regular potatoes? Or do you recommend against? 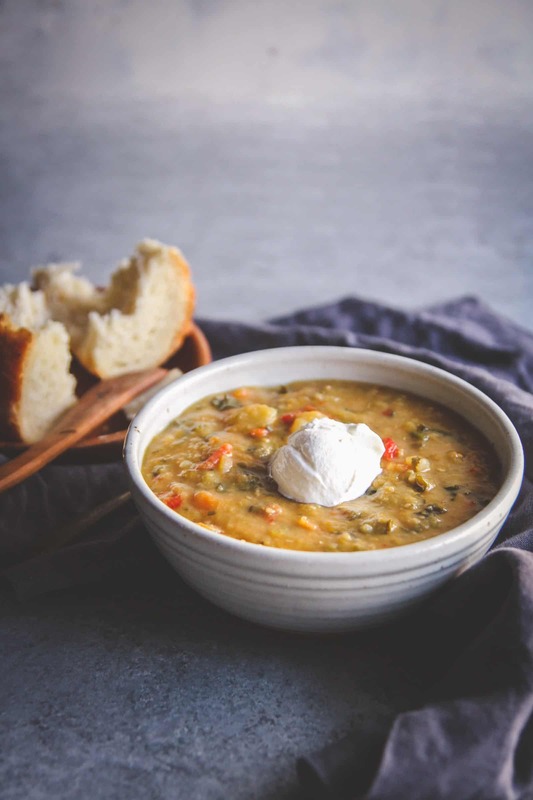 Without a doubt the best lentil veggie soup out there. I’ve made this soup a few times this winter, sometimes adding chicken stock as well as chicken or turkey sausage. It’s been dubbed by my sister as the greatest soup there is. And it’s certainly true! Oh I love love substitutes and additions, thank you so much for your kind words, so glad you like this soup!! Just tried this recipe, and it turned out delicious! I used spinach instead of kale, and it worked perfectly. I also added a little more stock because I was serving it to a larger crowd, so I also added a little more of the spices and a little quinoa to thicken it up some more. Everyone loved it! I’ll be making this again soon! I’m so happy to hear that you loved this soup, thank you for sharing your feedback, I love all the substitutions and additions you made! How finely do I need to chop everything? Is a rough chop going to be okay? I am eating this as we speak. Followed the recipe almost exactly as instructed, except I followed one commenter’s advise and went easy on the carrots while adding lots more lentils. Came out like pureed soup and it’s DELICIOUS. 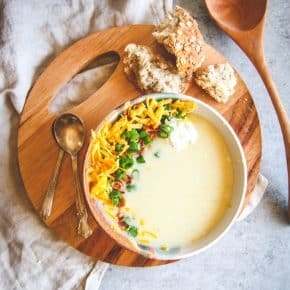 Exactly the kind of winter soup I’ve been craving. Thank you for an awesome recipe and new favorite!! I’m so happy to hear how much you loved the soup, thank you so much for sharing!! Will this soup freeze well? For how long? I think it’s really delicious. Currently my healthy diet is seemingly boring. While not craving for energy or fat, the menus are making me a bit embarrassed to continue to maintain this diet.